In my email programme I keep a list of all the things that I want to blog about. As there are now over one hundred things on the list you could say that I have something of a backlog. My track record would suggest that I'm most unlikely to begin blogging five times a day in order to work my way through this, so I'll perhaps look upon it as a databank of things to be brought out when nothing I can say about what I've currently been doing feels quite right. Today is a cosy slippers sort of day. Chilly weather, chilly thoughts...I just want to snuggle into something past and absorb the warmth from a day that felt better than today does. 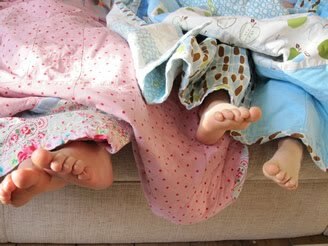 So my children's toes peeping out from the previously unblogged quilt that I made as one of Dinosaur-boy's Christmas gifts feels just perfect for that. You might remember that the pink quilt was made from Zebra-girl's old curtains a couple of years ago...but somehow the right fabrics never quite appeared for Dinosaur-boy and so he passed a couple of quiltless years, before I felt propelled into action to redress the imbalance and go searching for something that he might like. To go with some Kaufman apples, I chose some Monaluna prints from the wonderful Seamstar*, who whizzed them straight in to the post to arrive the next day, on December 16th. Once they arrived I found myself hampered by trying to find a solid fabric that matched the unusual aqua colours of the Monaluna prints and it took me several days just to get started, eventually compromising with a solid that has an unusual sheen to it, which, despite it's 100% cotton make-up, could never be described as a quilting weight cotton. This was a compromise that worked well and actually, it's a perfect colour match and in retrospect was just right for it. However, I'm not actually thrilled with the quilt. 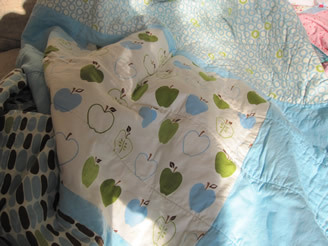 Zebra-girl's quilt has always felt soft and warm, but despite using the same type of batting, Dinosaur-boy's quilt lacks the softness of Zebra's fabrics which had previously been hung in a window and faded and aged by the sun over several years. During the quiltless years Dinosaur-boy had got used to having a very soft fleecy blanket over his duvet cover, so I worry that he finds this far less snuggly. I wish that I had backed the quilt with a soft flannel or a light fleece...but I rejected those ideas thinking that he'd find those fabrics a little too childish. I'm hoping that with time and use, it will soften into something more lovely...but at some point I may make him a second quilt with different backing. First though, I have to make another one for Zebra-girl, whose room we are attempting to de-pinkify (for yellow is now the colour of choice). I love this photo which shows the funny way that Dinosaur-boy twists his middle toe beneath the others. Later that day they raced around with the quilts over their heads pretending to be monsters. This is the quilt patch that I think I must have sewed on very shortly before Christmas day. Quilt patches are my favourite part of any quilt. 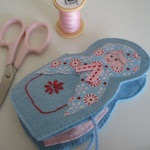 I love that they have to be sewn on by hand and are always the very last thing to go on. 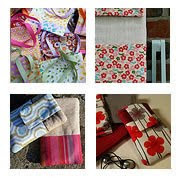 *And they really are wonderful - they once emailed me to let me know of another online UK fabric shop that had just started stocking a fabric that they knew that I was looking for...how often do you find service like that? Actually all the online fabric shops that I've ever used have provided amazing service, but the loveliness of Seamstar doing this has made me love them all the more. Do go and have a look at their new fabrics, as they have prints by Keiki and Lauren & Jessi Jung that I've somehow never seen before, as well as new fabric ranges from Chez Moi that I love (but as they are pink I am forbidding myself to buy any, as I must concentrate on accumulating yellow) and, of course, some of Anna's dreamy voiles (which seem to be cropping up in many more places in the UK...but still not in any of those dobby spots that I'm longing for). As promised in my last post, here is the coaster tutorial. 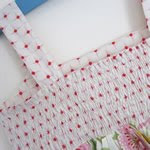 This method of making them with self-bound edges should produce perfectly straight edges and provides the opportunity to play with contrasting fabrics if you want to. I've also tried to cover proper techniques for using a 1/4" foot (owning one is not essential to using the pattern), as well as how a Ladder Stitch is formed...I'm really aware that many of you will already know both of these things and may only use a tutorial for the convenience of working from someone else's measurements...however, I wanted to include these details for those who are newer to sewing, so please forgive me if it seems a little over-instructive. 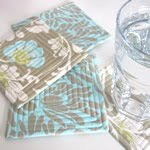 You can make different sized coasters with this pattern, but you'll need to remember to make the larger square 2" bigger than the smaller squares. The finished size of the coaster will be the same size as the smaller square. 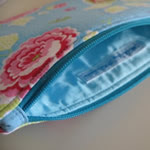 Or if you like the binding detail (see photo below) you could accentuate this by using a contrasting fabric and have the side that shows this as the front. 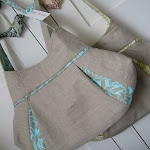 The binding is created from the larger square of fabric. I haven't had a chance to make any with contrast binding yet, but I'll post a picture here when I have. 1 x 6.5" square of quilting weight fabric (as well as being on one side of the coaster, this piece will also form the bound edges that appear on the other side of the coaster). 1 x 4.5" square of quilting weight fabric. 3 x 4.5" squares of quilt batting/wadding. 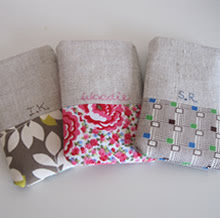 (I use 1 piece of heat proof batting and 2 pieces of regular quilt batting. 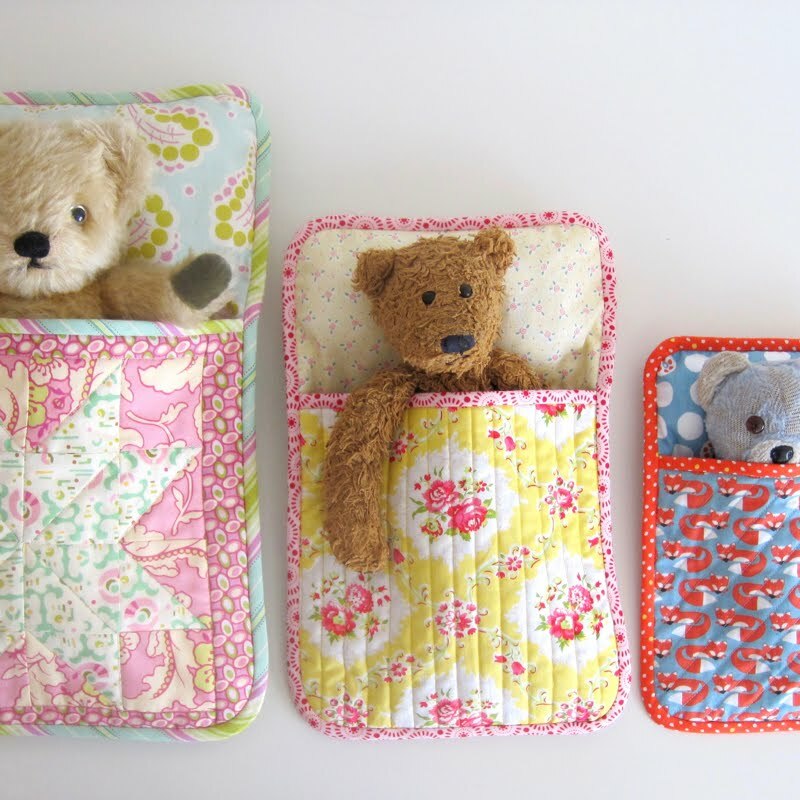 Bear in mind that whatever you use will be hugely compressed by the act of quilting so densely, so try to use something with a good loft). Basting spray (this is a temporary adhesive that is commonly used in quilt making - it will stop your fabric pieces from moving around. I use one called 505 that is widely available). If you don't have any of this to hand then some quilting pins are a good alternative. A 1/4" foot for your sewing machine is incredibly helpful, but not essential. 1. Iron the cotton fabrics and then cut the amounts of cotton and batting required as per the ingredients list. 2.Create a quilting sandwich as follows: lay the largest fabric square face down, using spray adhesive to baste, place the quilt wadding centrally above this piece. 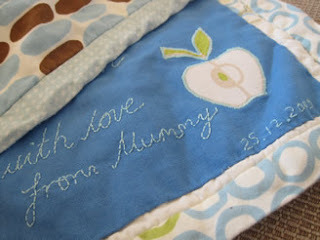 Finally place the smaller fabric square on the top, face up, using spray to baste in place. 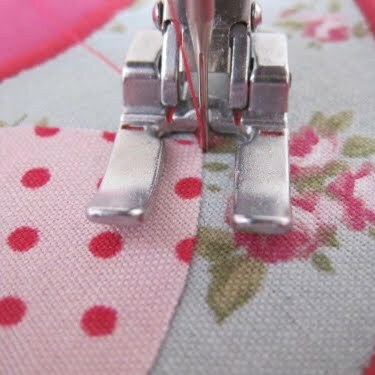 If you don't have a 1/4" foot for your sewing machine then you have several options: you can use the free-motion quilting technique if you're already experience in that or you could quilt in straight or diagonal lines using the edge of your sewing machine foot as a guide for keeping your quilting lines nice and straight and equal distances apart. Not quilting in a spiral you have the advantage of quilting outwards from the centre (the best way to quilt). 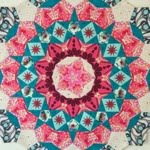 Just draw a dividing diagonal or straight line at the centre with disappearing ink, stitch along this and then quilt outwards to either side using the first line as a guide for the next row of stitching. 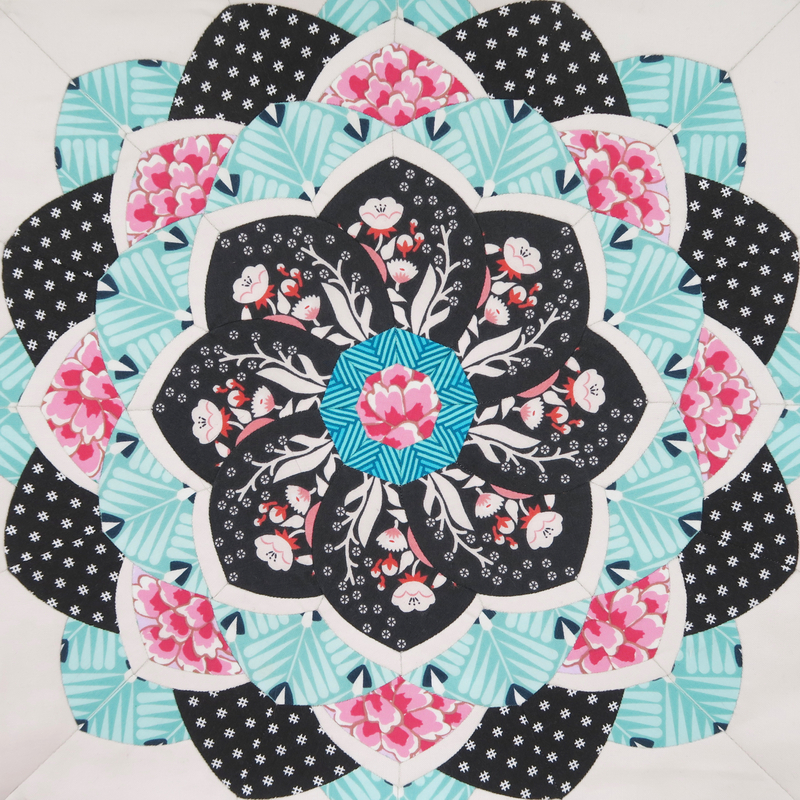 Quilting in a square spiral is difficult without a 1/4" foot and the results may be imprecise...but that's fine if you're happy for your item to have a more cosy, home-spun look. 3. If you do have a 1/4" foot, then proceed like this: Start sewing from any edge, exactly 1/4" in from the side. If your 1/4" foot has three horizontal markers on it, at this point the line at the rear should be in alignment with the fabric edge when you take your first stitch. 4. 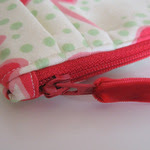 Stop this first line of stitching when the first line on the 1/4" foot reaches the edge of the fabric. 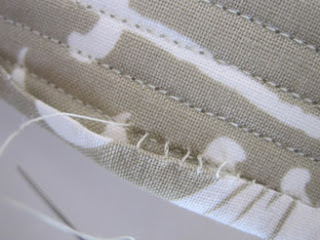 Lift the presser foot, pivot the fabric and begin sewing along the next side, stopping once again when the first line reaches the edge and indicates the need to turn the fabric. 5. 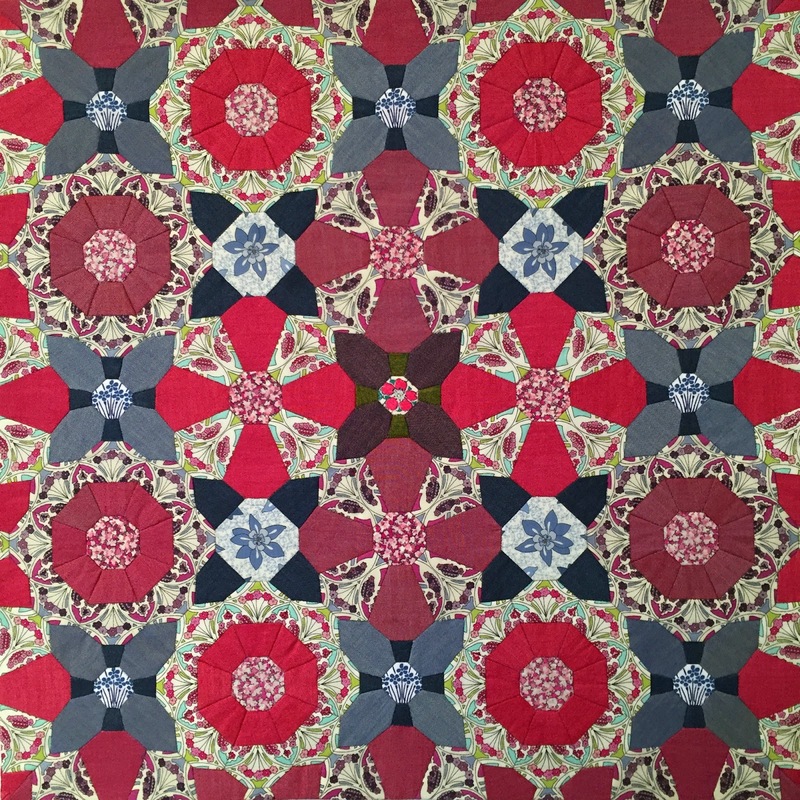 When the fourth line of stitching is nearly complete, use the first line of stitching as your guide to indicate when to turn the fabric and continue in this way, spiralling toward the centre until the entire coaster has been quilted. 6. After quilting you may notice several things: that your larger fabric has moved slightly and that there isn't an equal amount of fabric protruding from each side of the quilting sandwich. 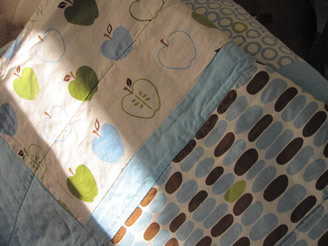 You also may notice that the edge of the small quilt sandwich looks tufty and unruly. In the next step we remedy those two things. 7. First iron the quilt sandwich and the base fabric with a firm, very warm iron until the tufty edges have been beaten into submission and look more manageable. This step is important as otherwise it will be difficult to create a neat binding. Now take a ruler, and using the inner quilt sandwich as a guide cut the larger piece of fabric so that only 1/2" is left protruding from each side of the sandwich. 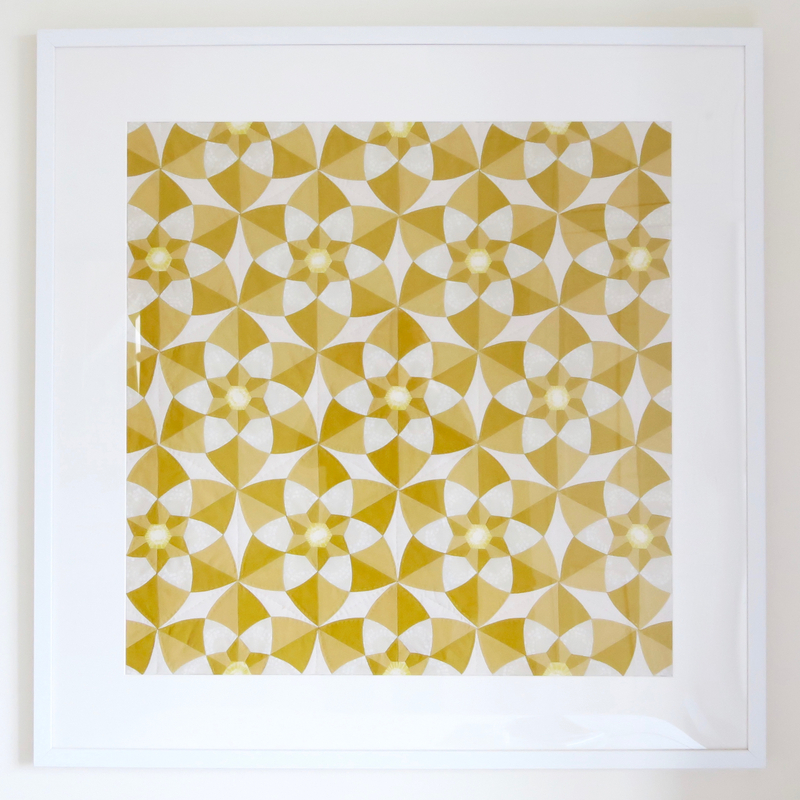 This can be done quickly with a rotary cutter, but scissors are fine if you don't have one. 8. After ironing and squaring up, it should look more like the picture above. 9. To create the bound edge fold the single layer of fabric inwards toward the quilt sandwich, so that the raw edge touches the sandwich wadding. Now pull the folder outer edge up and over the edge and pin it in place just a fraction past your first line of quilting. 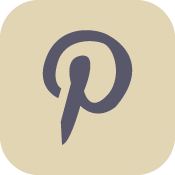 Normally I place my pins in perpendicular to the edge, but this is fiddly, so I recommend placing pins parallel to the edge here to make sure things stay in the right place. 10. When you come to a corner simply make sure the first edge is folded in nicely and then fold in the other edge so that it covers this, as shown above. 11. 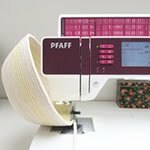 If you're in a hurry you can machine quilt this bound edge in place, however, a much better finish can be had by hand-stitching the fabric in place, using an invisible ladder stitch. i) To create a ladder stitch, after securing your thread in the fabric, take a stitch through just the upper layer of the quilt sandwich (see picture above). ii) Now take another small stitch through the edge of the binding fabric, entering exactly opposite to where the thread has just come out. Do not pull this stitch tight, leave it very loose. iii) Now return to take another stitch through the upper layer of the quilt sandwich, followed again by making another through the edge of the binding fabric. After four or five stitches, pull the loose threads up and they will magically disappear and the fabric will be held in place just where you wanted it to be. Repeat to bind the rest of the coaster, stopping every four or five stitches to draw up the loose thread. 13. Finally press with an iron once more and then go and make a nice warming cup of hot chocolate to put on the lovely finished coaster...I find this produces the best results in completing the remaining coasters to be added to the set (yes, it's May...but this tutorial comes to you from chilly England! x). I'd love to see any coasters that you might make from this pattern - you can either email me or drop them into my Flickr pool here. If you run into any problems then do let me know and I'm happy to try and help (although those who know me well would perhaps suggest that 'Florence' and 'email' are not synonymous with Rapid Response...but I do normally get there eventually!). I also wanted to mention that my paid-for patterns (eyes right in the side bar: that's the Tabitha Bag and the Lis iPhone Holder patterns) are now all the same price at £6.50 (that's approximately $9.40USD or 7.60 Euros) ...which is also a few pounds cheaper than they used to be too. This tutorial may not be reproduced in whole or part either online or offline. I am, however, always grateful when people link to one of my tutorial and you're welcome to use one of my completed coasters photos to illustrate the link. This is just a quick hello post as it seems like such a long time since I posted and I also wanted to welcome anyone who has come over from the wonderful How About Orange... - so lovely to have you here. On Saturday I will be leaving the country for the first time in nine years for a quick weekend away with my sister, so in between dancing up and down occasionally, I've been working on a free tutorial for the coasters above...my writing this has come about fairly organically as I went to make some coasters at the weekend for my father and found that all my attempts at following the conventional route of construction (making a little square bag, inserting the wadding, folding in the side and then quilting) resulted in coasters with very slightly wavy edges. No amount of careful pining beforehand seemed to stop the coasters from changing shape very slightly under the density of the quilting. After sleeping on it, I woke at 3am with the answer in my head. My new way of making coasters has edges that are self-bound after quilting to make them extra square. It also means that if you want to play with contrasting fabrics, then you can (you can't see the binding on the photo above as it only shows up on the other side, from this side they just look like regular coasters). The tutorial will hopefully appear on here tomorrow or Wednesday. But in the meantime I wanted to say thank you for the lovely links that you left in the comments section of the last post and also to thank you so much for all your votes and enthusiasm for my entry into Spring Top week. I think I came either second or third...or maybe fourth - it's hard to know which as one of the tops (the grey jersey one) suddenly galloped ahead having accumulated nearly 500 votes in the last hour or so of the competition (I was fast asleep by then) and knocked the top that had been the favourite throughout the final round from its winning position. However, Rae decided to go with the top that had been in the lead from the start and I'm so pleased that she did: the best top definitely won and I wish that it was in my own wardrobe (because it's gorgeous...not just because it's won a whole load of wonderful prizes!). Adrianna, its maker, is one very clever seamstress. Thanks so much to Rae and all the judges for their work to make it such fun. 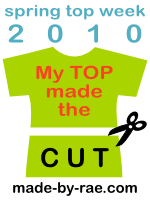 And guess what...all the makers of the final tops have been invited to be judges next year! Hurrah! 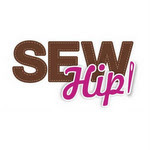 So I didn't win Spring Top week (no surprise...but a completely thrilling surprise to find that my top made it to the final when there were so many other lovelies), but Colette from Sew Tessuti wrote to me last night to let me know that I had won their 18th birthday giveaway! Readers of the last post will know quite how much I love Japanese pattern books...and picking one from their huge selection was actually the prize! (I know, this is an appalling overuse of the exclamation mark and many of you may have stopped reading at the second one, but I feel that my excitement can't be properly conveyed without them). If you haven't heard of Sew Tessuti then it's a fabric shop based Sydney, Australia and they have a completely dreamy range of Japanese Pattern books as well as a really good selection of fabrics. 'Delighted' doesn't quite sum up the feeling of butterflies dancing in my stomach as I read Colette's email and then spent a happy hour trying to decide which book to choose. Eventually I chose this one as I don't have any pattern books for making children's clothing. I shall try not to hover by the postbox too much as I have no idea how long it will take for my book to make its way across the seas. You can see the binding in the above picture. I chose not use contrasting fabrics here, but I'm going to make some for Zebra-girl and Dinosaur-boy that do. I hope that you're having a lovely week. Firstly, thank you so much for all you lovelies who have been over and voted for my top in the Spring Tops competition (or one of the others...because they're all lovely and I'm up against two of the tops that I'd picked out as being my own favourites right from the start, so I'm delighted just to be in the final alongside them). There's still a little time left for voting and any votes for my top might just help me be defeated by a narrow margin rather than a gaping abyss! Thank you also for the excellent advice left on creating Flickr mosaics on my last post - I really appreciate it. Anyway, onto those Japanese craft books that I'd started talking about recently. (I wrote about the top above which was made from a Japanese pattern book here). I look through one at least once a week and my mind is becoming increasingly dominated by their subject matter, so I thought that they deserved a whole post all to themselves, so that those who haven't yet discovered their wonderfulness, might be inspired to rectify the situation...and also because I have some links that I wanted to share. 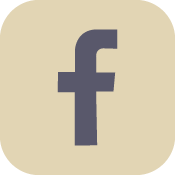 If you have any of your own then please do put them in the comments section - I'd love to discover more. There's so much to love about these pattern books. The photography and styling is utterly gorgeous: minimal, understated, calming and utterly inspiring...I can't tell you how many times I look through them just to get lost in the pictures. But they're so much more than pretty pictures. They're insanely good value when you think about how many patterns are included. 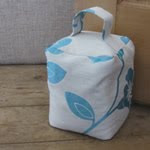 There are normally around 20 patterns, which for about £16 works out at roughly 80p per pattern...so much less expensive than a Simplicity pattern. What they lack in instructions (they're in Japanese) they make up for in pictures and illustrations, which are so much more explicit than any of the long-winded explanations that can be found in regular patterns, that one is able to start with a clear idea of the steps that need to be completed. They often show the finished garment with numbers labelling each seam to indicate the exact order that the pieces should be assembled in, which is fantastic as they make useful study books for understanding the best order in which things constructed. Every thing in their design is geared toward making them comprehensible without the need to understand any written words. At the back there is normally one double-side fold-out piece of paper containing all the patterns. At first glance an intimidating spaghetti junction of pieces, but actually, that too is remarkably easy to fathom once you've studied it for a while - you simply peer around until you've noted all the numbered pieces that you need and then trace them off...and it's on lovely thick papery instead of scary whisper-thin tissue...and I write this as somebody who has held a long fear-based aversion to patterns...so really, if I can do this, then anybody can. 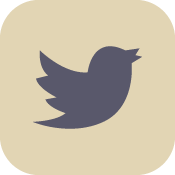 Anyway, let me share some resources with you - many of which you might already know of, but perhaps there might be something new and interesting in there. I could go into all the ins and outs of using the patterns myself, but Purl has such an excellent tutorial on this that it seems easier to direct you straight there: they cover adding seam allowances, tracing the patterns off and even translate some of the Japanese that it really is helpful to know (such as the symbol for front and back). Until recently I've been buying my Japanese pattern books from Yes Asia, which has a huge variety. 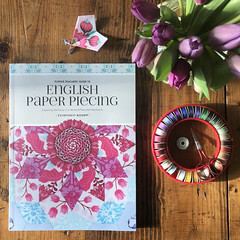 However, last week I nearly fainted with happiness when I accidentally discovered a lovely online shop based in the UK that stocks a really fantastic variety of Japanese pattern books. The prices seem no more expensive than that of Yes Asia, but thrillingly, come without the four-week wait for them to arrive! The shop is called M is for Make and it also stocks Collette patterns, Ottobre magazine, a couple of the much coveted Nano Iro prints and so many other lovely things. M is for Make's owner, Kate, also has a blog, which you can find here. Another good place to visit is Crafting Japanese, a Japanese craft book resource. It features many Japanese craft books and beneath each has a list of links to items that have been made by people from that particular book. 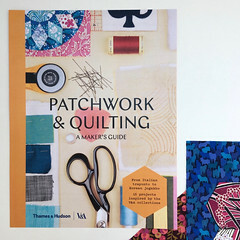 It's a fantastic way of getting a sense of the contents and style of the book before buying it...as well as coming across a lot of previously unknown blogs to add to your Bloglines and stitchery to drool over. 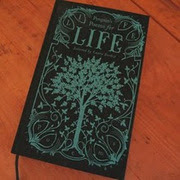 If you've fallen in love with that and still want more then do go and have a look at Japan Craft Journal. 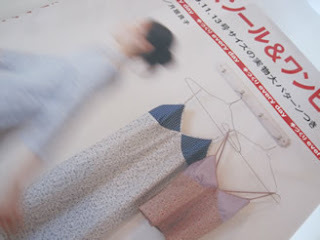 Over on Flickr there are also some group pools devoted to sewing from Japanese craft books: my favourite is Japanese Patterns on Adults because it specifically focuses on clothes and often helps me narrow down which book I really want by seeing what others have been making from them. 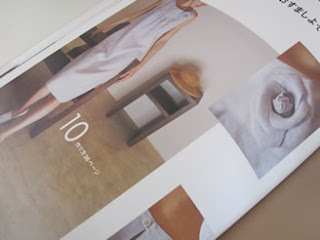 Inspiring Images from Craft Books often seems to include shots from almost every page of certain Japanese craft books. There are several other groups too, such as Japanese Sewing, but one has to hunt out the clothing shots from in amongst all the other loveliness and in the midst of garment-obsession this isn't necessarily welcome. Finally, Ana from Stash Avalanche asked me to talk about sizing. My experience with standard patterns so far has been that I've had trouble finding ones that accommodate my smaller frame, but not so with Japanese patterns: despite their often flowing silhouettes, the garments tend to be cut slightly smaller, for a typically Japanese figure. Using Japanese patterns is the first time I've ever found it unnecessary to lop a couple of inches of the bottom of the pattern piece so that I'm not swamped...and as I'm only 5ft 1 then I'm guessing that those above average height may need to add on a little extra. However, as the pattern pieces have no seam allowance included then this is incredibly easy to do without distorting the shape of the final garment. I've frequently read complaints from people above a size 12/14 saying that the patterns are just too small....and really, that does seem a little restrictive as those sizes are hardly large, but again, with no seam allowance included there's nothing to stop the patterns from being traced onto the paper and then made bigger. The only other thing to mention is darts. I'm yet to come across a Japanese pattern that has darts at the bust, something that I feel benefits the shape of clothing for even a very small B cup. However, again, these are really easily added in. If you don't feel confident in adding darts or lengthening patterns then there are two books that have given me all the confidence I need to take patterns apart and make them just right for me. One is Cal Patch's book (which strangely omits bust darts, but once she's taught you how to create them at the waist the knowledge is easily transferrable for doing this in other areas, so that oversight doesn't actually matter UPDATED: Cal has now corrected me on this - she does actually cover bust darts while making a dress that I haven't tried out yet - p.93, basic dress - which means that this book really is completely perfect in every way - hurrah! ), the other is a book that Mr Teacakes bought for me called How to Use, Adapt and Design Sewing Patterns , which focuses a little more on existing patterns rather than starting from scratch - it's very clear and packed full of helpful advice. This is one of my favourite images...I love that the photo is so unmodelly and that her legs look just like mine would in the this length of dress with flat shoes on: a bit matronly. Inspiring and affirming! Another clothes-making post next time...I've made my own trousers, from my own pattern (drafted with the help of the two books mentioned above ). And they actually fit! I said that my next post would be on Japanese pattern books...and it will be: please look upon this as an unexpected interim post! For those of you who voted on my Spring Top Week Entry in the Semi-final round yesterday, I am hugely appreciative and flattered: my top got through to the next round! Thank you so much! The final voting will take place this weekend. It's such a huge delight to be in the final five tops - I can hardly believe it. The other tops are all completely lovely and horribly stiff competition...so I'd love it if you would go over there and vote for whichever top you like best - which would be wonderful if it's mine, but equally lovely if it's one of the others, because they're all fantastic. Press the voting button now! JJ Blouse - by Hokidoki (So perfectly fitted, I really want to have a go at making one of these too). 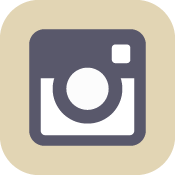 Does anyone know how to make a Flickr mosaic by the way? I would have loved to have shown you photos of these. Anyway, thank you so much for voting if you did...and if you vote again now. 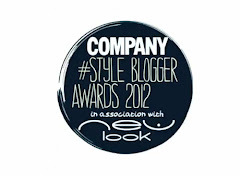 I was so delighted to wake up this morning to find that my Spring Top Week entry has made it into the final 60 tops. 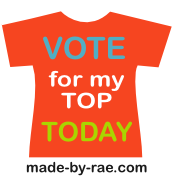 But now it's over to you: if you like my top would you pop over to Made by Rae's and vote for it? You can vote on my top (or any of the other lovelies: at the time of writing I can't see which other tops are up for Friday's voting, but the tops from the other days have been fantastic, so I know these will be too) for the next 24 hours (that's until about 7am on Saturday EST time, or until about 11am on Saturday GMT...and lots of other times in between for everywhere else). I also wanted to thank you so much for all the lovely comments that you left about it on my last post and over on Flickr and Twitter. Fighting off a cold that has given me a temperature of over 103F this week I have found myself rather feverishly (literally) making another summer top (it's too late to enter this one into Spring Tops Week, Rae's ignited an addiction). 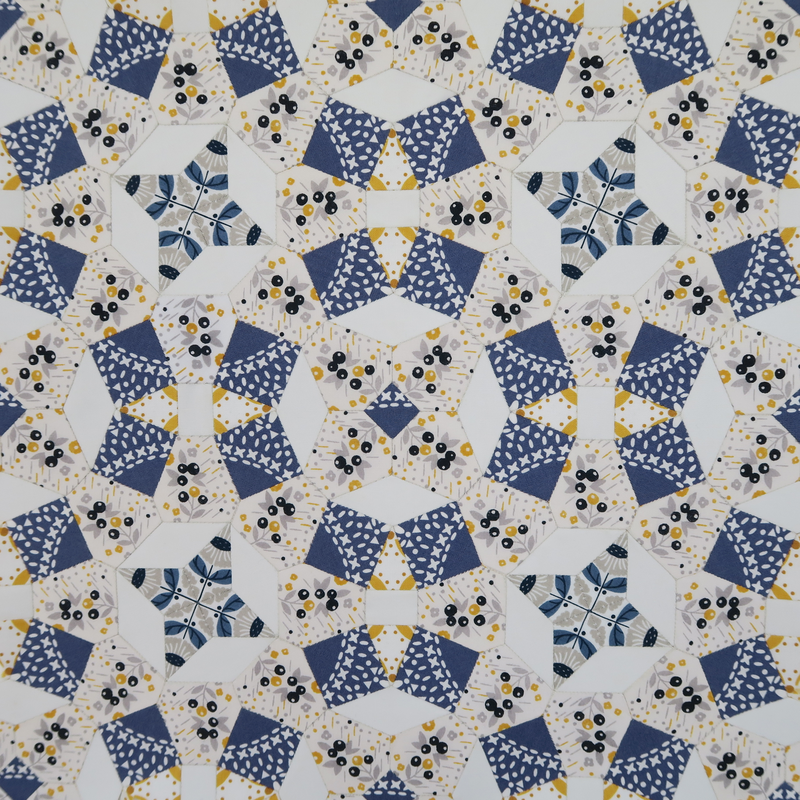 This one is from a pattern in the Japanese Everyday Pattern book (my next post will be solely about Japanese pattern books as I have too much to say about them to squeeze it all in here). I was so delighted by this pattern - it's so simple and the sizing was perfect first time, something I've never found with a Simplicity pattern, which needs so much tweaking to get right. I was so pleased with the fit at the back that later I suddenly decided later to try the muslin on back to front...and amazingly I realised that with a lowered neckline this would make the perfect template for a structured, more fitted top (this realisation was made late at night...apologies for both lighting and pyjama bottoms). It looked a little plain like this, so I added the ribbon that was shown in the original pattern, but centrally, rather than to the side to facilitate cardigan wearing without mysterious bulges. The fabric is a very densely patterned Liberty lawn...a couple of weeks ago I used this fabric with a different sewing pattern and the pleats and yoke were swallowed by the print and the final top looked awful (which was frustrating as the muslin version was lovely). However, I think the fabric works for this top, where it has little detail other than gathering and bound edges. I originally bought 1.5 metres of each of these Liberty prints with some gift vouchers that my lovely Mama had given me in March...the happy thing about making things for warmer weather is that with no sleeves, you need less material...making four tops (with some to spare) from three metres of material seems inexpensive even when using Liberty lawn (or it would be if they were all wearable). 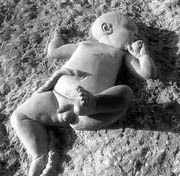 The unhappy thing about them is that they show off my skin to be pastry coloured...a little sun would be a nice thing. Wishing you a lovely weekend and thank you so much if you choose to vote for my top.